Debarati Mitra's (b. 1946) books; a large majority of her best work, are carried by presses and publishers of the official culture, mainly by ABP. She also received the Ananda Puraskar in 1995. Her style is modern, subjective, lyrical, intense and lives far higher than the stereos of gender-centric literature. This has earned her a distinctive place in Bengali literature. Her first book, Andha Skoole Ghanta Baje, (Bell Rings in the Blind School) was published in 1974. Subtle, metaphorical and delicately wrought, her poetry has been widely acclaimed and won many awards. She is believed to have drawn some blood from the devotional Shakta poetry of Bengal. Needless to say, therefore, Debarati Mitra represents one of Bengal's best modernist voices even when her work is not segregated by gender. At the surface language level her poetry is at once made communicative by lyrical ease and sublime tonality; a profounder tectonic study, however, reveals in deeper layers, her subtle dealings with a plethora of issues - social, mnemonic, sensuous, poetic, philosophical, aesthetic and sexual. While one one hand her abstract imagery comes to rest on surrealist metonymy, on other hands her work is sometimes synesthetic, at times boldestly sexual and aesthetically accomplished, often peering into social and psychological landscapes of both women and men. 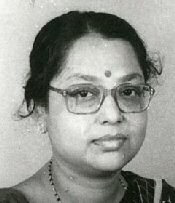 Debarati was born and raised in Kolkata; graduated from Jogmaya Devi College, Kolkata University; has authored eight collections of poetry, married to poet Manindra Gupta with whom she lives a quiet life in South Kolkata. Some representative poems of Debarati Mitra that cover her range and styles. The day’s over for now. willingly droops on the chopping block of pain. the wild sunflower shadows it. Slowly chimed the clock at a conked out hour. realm beyond realm, to the solitary sea. gazing at the sky weeping silently ? sometimes, abstractedly, in the mountains. next door like a blurred lion’s face, a sunflower. And the bell chimes faraway. Translated by Malay Roy Choudhury & Aryanil Mukherjee. - the wooden bird lies dead in its box. on the right is the red cross of Sudha Pharmacy. they will not return again. there is no one below the margosa tree. myriad shredded blackbirds are lively in the mist. Krishnachura - A tree found abundantly in Bengal; has mauve spring blossoms. why so much hidden green pigment flew off last night? Sunwheel at wildwooded Konarak spins to make music. breath thick with sugary scent. What did you have in your mouth? aggravating cold of a cluster of distant stars. Konarak - An east-Indian town famous for its sun-temple. My blood and soul agitated alike. Why, why so dark a mole on the left corner of your lips? That haunting lyric, its notes. Like a slender rusty nail or a sacred cross. From where comes the light of now ! What’s in it ? How many pages, which worm? Enjoyed a million suns once, now distilled. Abode meaning the summit, not heaven-home, not ghostland. I lack a proper vehicle, can never reach there quite. Wind O’ Water, how do I blend into your animal sublimate ? There’s no hole in the horizon. Fusing into a nebula, immiscible soul. A mother's face as if. Making his doll with extended care ? Didn’t say in some symbolic mudra, "I love you". Puja - The word puja means worship. However, puja in the Bengali world often refers to Durga Puja – the annual 5-day autumnal festival of worshipping goddess Durga. Puja is holiday season for Bengalis.